A DNA test conducted on a canine killed near Elk Creek in the Clearwater region of Northern Idaho in November determined that the animal was a dog, not a wolf as previously thought. A big game mortality report completed by the Idaho Department of Fish and Game and given to the Idaho Mountain Express this week lists the animal’s species as a wolf, and further states that the animal was light in color and killed with a rifle. John Rachael, game manager for the Idaho Department of Fish and Game, said Wednesday that the animal was tagged as a wolf and apparently shot accidentally. The report states that the shooting was incidental, meaning that the hunter was likely hunting deer or elk when an animal he thought was a wolf crossed his path. Rachael said the hunter had a wolf tag, and took the carcass to the Clearwater Regional Fish and Game Office with the belief that it was a wolf. Rachael said he didn’t know the entire set of circumstances—and Clearwater Regional Supervisor Dave Cadwallader was not available for comment as of press time. At some point, an investigation was triggered that led to the DNA test revealing the animal was a dog or possibly a dog-wolf hybrid. “There were some other circumstances that led them to believe that this might not be a wild wolf,” Rachael said. 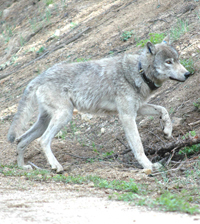 Wolf advocate Lynne Stone, who received the report through a Freedom of Information Act request, said she has heard conflicting information about the circumstances surrounding the animal. Her main concern, she said, is that the animal managed to pass by Fish and Game officers and be tagged. Rachael said he believes the hunter made a mistake—that many dogs look like wolves and could have been roaming loose in the area. Rachael said the circumstance was “fairly unusual” but that the Idaho Department of Fish and Game does not keep records on incidental domestic dog kills. The agency is charged with tracking game and wildlife deaths, he said. However, Rachael urged dog owners with animals that look like wolves not to allow their dogs to roam free in wolf hunting zones. Wolf hunting season runs until March 31 in the Southern Mountains Zone, which includes Blaine County, and begins again on Aug. 30.